** Week of August 4th-August 11th, 2018 is now AVAILABLE due to a cancellation. Old Lodge House located directly on Lake Alice. Great for multiple families, family reunions, corporate retreats. Bar and game room located on lower level. Just added two 22-foot tournament length shuffleboard tables to the game room in 2016. Great fishing and boating on beautiful Lake Alice a 1300 acre lake that is part of the Wisconsin River. Docks available. Snowmobiling, cross country skiing, ice fishing available right outside the back door. Downhill skiing available 10 minutes away at Camp 10 ski area or 40 minutes away at Granite Peak in Wausau, Wi. The is a large waterpark available 40 miles South in Wausau, Wi. Minocqua is located just 30 miles to the North and also includes an indoor waterpark and several other restaurants and amenities. Reservations only accepted one year in advance. Call or email today for more details and specials. Hi, I'm Tim McMahon. About 10 years ago, my brother Dan, my sister Maureen, and myself, got together and purchased this unique property to enjoy with our family and friends. 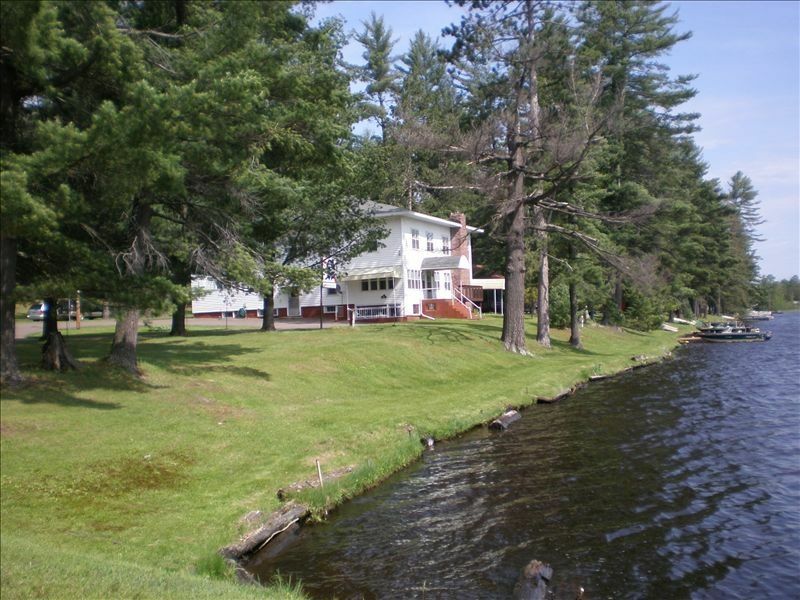 We would like to share this property with those looking for a one of a kind place where everyone can stay under one roof and enjoy the benefits of the great Northwoods. There is no place more beautiful or where the people are more friendly and welcoming than Northern Wisconsin. Our place is located only about 40 feet from the shores of Lake Alice. The lake level is controlled by King's Dam which only allows a 6' variance throughout the year. Explore the 1300 acre lake or travel 5 miles up the Wisconsin River. The lake is stocked with Muskie, Walleye, Large Mouth Bass, Small Mouth Bass, Crappie, and other delicious game fish. Enjoy the lake year round ice fishing or snowmobiling. Good times never go out of season. 13 Bedrooms, 7.5 bathrooms, large dining room, game room, over-sized kitchen with a commercial 6-burner stove and dual-oven capacity. Enjoy hot dogs and smores over our outdoor fire ring down by the lake or use one of our 3 grills to cookout the meal of a lifetime. A few window units are available if needed. Flat Screen TV's are located in the bar and game room, TV Room, and 3 of the bedrooms. It was everything it said it would be. The only negative was the jukebox wasn't really working. Overall, we had a great stay. Just got back from our 3-family reunion at the Muskie River Lodge - totally amazing! We are already planning for next year. Plenty of space for everyone to do their own thing plus plenty of space for everyone to be together. The kitchen is well stocked with cookware and dishes and lots of room for group cooking and visiting. Lots of towels and linens and blankets - well stocked on toilet paper and kleenex (this may seem weird, but we have had many group vacations and we bring pots/pans/dishes/paper products, etc but this place was amazing) (yes, I keep saying amazing because it's true) They even had multiple coffee pots! And multiple refrigerators. The fire pit was a big hit and the basement bar with pin ball, ping pong, shuffleboard was incredible (ok, it was amazing too). Best group vacation. Oh, and thanks so much for the main level bedroom and bathroom - we wouldn't have been able to bring our 88 year old mother along had it not been for that. And yes, she had an amazing time too! Very clean and amazing rustic charm. Plenty of parking for lots of cars. The age of the lodge with very little updates since the beginning of its existence truly added to the character of the property. It was clean and comfortable, no musty smell and no mice. It was stocked with everything we could ask for. And no one in our group of 60+ women could complain about the comfort of our beds or the furniture. Do wish the bedroom curtains were thicker especially the rooms in the back with the yard light shining in all night. Unfortunately the weather didn't cooperate for us with the sun not coming out till the day we were checking out because we would've loved to take advantage of the outdoors and the lake. Hopefully next time. We are already talking about coming back in the future and would recommend the Lodge to other large groups. Our family came here 6 years ago for a family reunion and it fit us all perfectly while giving everyone the freedom to do their own thing (the game room in the basement was great for the younger kids). There's a nice spot down the street to rent a pontoon boat too. Beware of bringing things onto the pier as we lost quite a few sunglasses in the lake (very sad). The locals were really nice. Tim was incredibly helpful and responsive. Would recommend for large groups. Only complaint is the beds were not comfortable.